Zuma is part of the Azumi restaurant group that also owns Roka. Serving a range of sushi, robata grills and cooked food in a contemporary Japanese izakaya style, the setting befits its Knightsbridge location. It’s chichi and glamorous, and a magnet for some posh clientele as well which makes for some interesting people watching. There’s no hiding from the air of pretentiousness that surrounds Zuma. 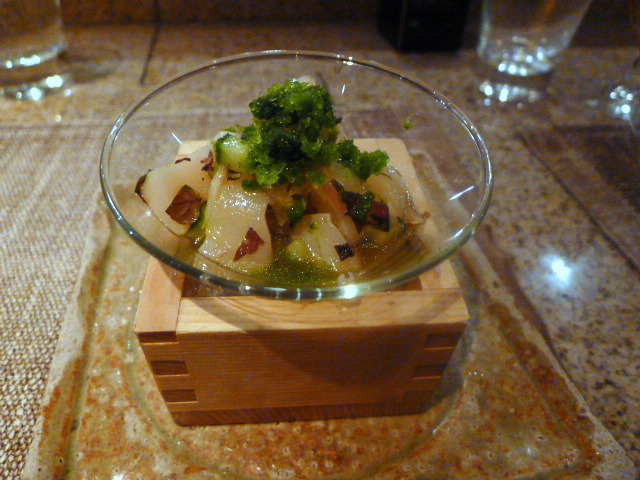 It is virtually impossible to get a reservation at Zuma, at least on a Friday night anyway. I have lost count of the number of times I have tried, only to be told that the restaurant is booked out. The alternative is to wait at the bar for a seat at the no-reservations sushi counter and robata grill. So that is what we did – wait – for two hours. Zuma has an impressive list of cocktails, but even then we still had to wait to be served as the bar service was rather slow. Food can also be had at the bar, and to appease the hunger we tried a couple of items such as the pork skewers (£5.30) which were tasty but extremely fatty and a touch salty. 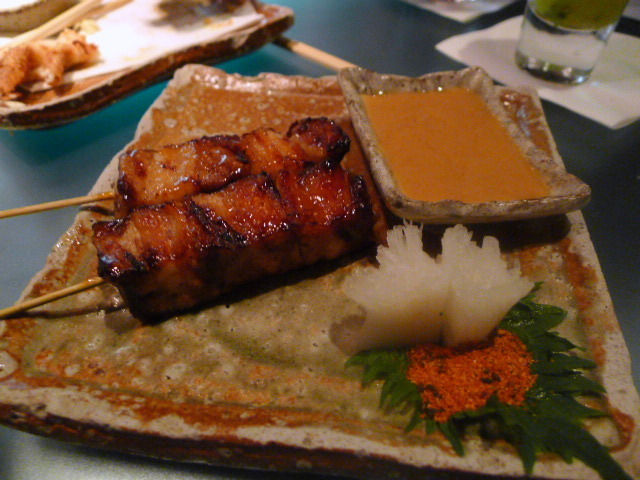 It came with a yuzu mustard miso that was a good match with the pork. 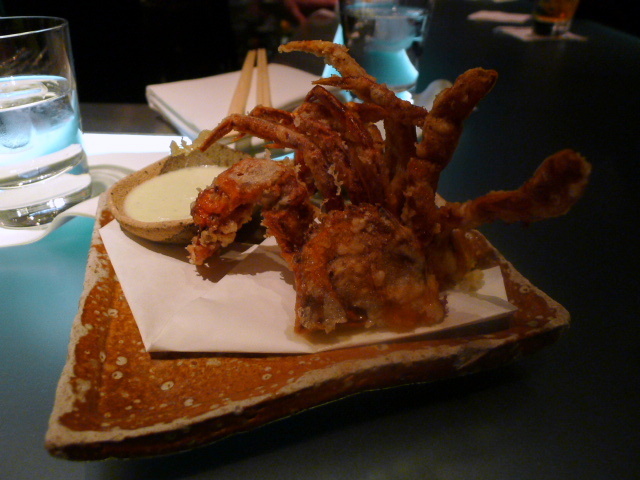 Fried soft-shell crab with wasabi mayonnaise (£11.80) was nicely done if a little oily. The spicy kick in the creamy mayonnaise worked well with the crab. It wasn’t ideal eating standing up, but when finally perched on at the table, we had the thinly sliced seabass with yuzu, truffle oil and salmon roe (£12.60). 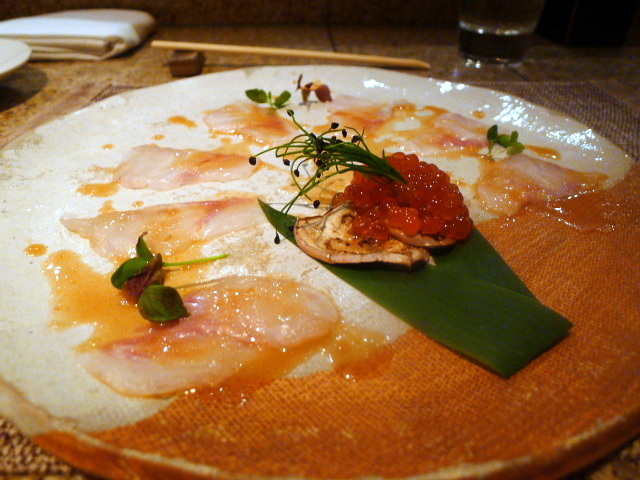 The seabass was beautiful, and the hint of truffle and yuzu were refreshing touches. But there was too much of the salty dressing to the ratio of fish, causing it to drown out its delicate flavour. The diver scallops (£14.80) in a dish with shishito granite and myoga tomato were simply glorious. Beautiful, sweet and soft, there was no mistaking its quality. The shishito and tomato were clever pairings for the scallops, but the coldness of the granite dampened its taste slightly. Shame. A mixed seafood maki roll (£8.60) containing yellowtail, tuna, salmon, fish roe, tobiko, daikon, avocado, cucumber and gobo (burdock) was beautiful. The flavours of all the ingredients worked wonderfully together, and the fish was fresh and sweet. 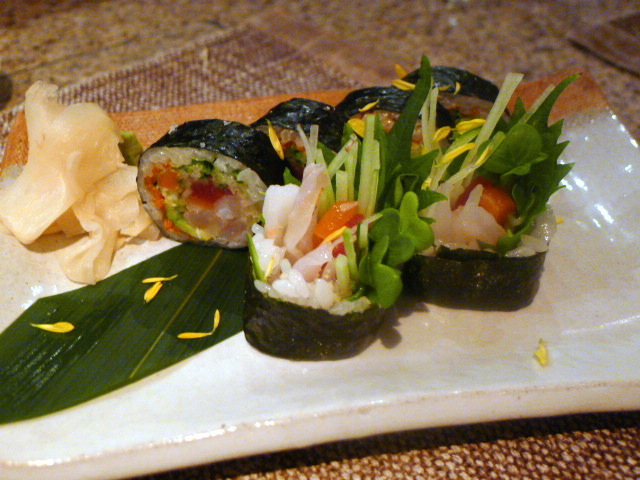 The gobo added a sweet earthy flavour to the roll. 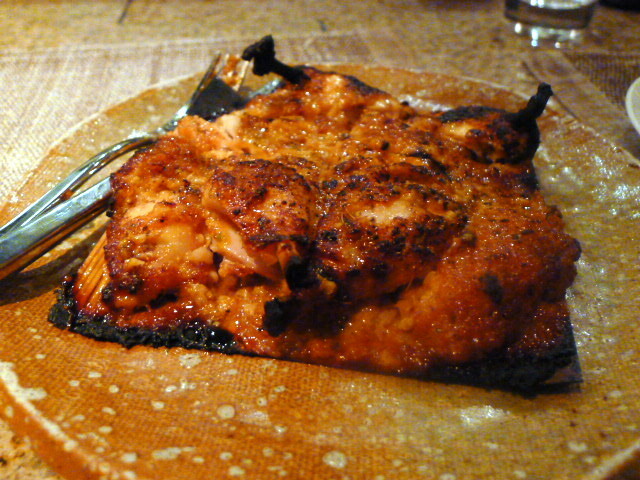 Less impressive was the barley marinated miso baby chicken, oven roasted on cedar wood (£17.60). The chicken was moist and well cooked, but the marinade was heavy, salty and a little overbearing. 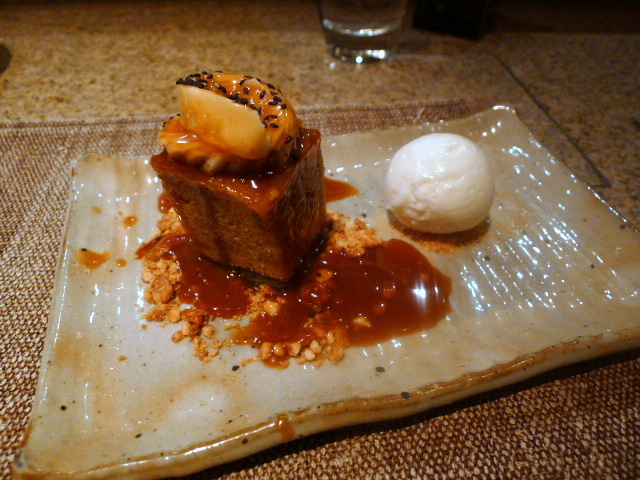 A layered green tea and banana cake with coconut ice cream and peanut toffee sauce (£8.60) was gorgeous. The cake was wonderful and moist, with the contrasting layers proving interesting. The ice cream was lovely, and the nuttiness of the toffee sauce was fantastic, matching perfectly with the cake. There were some sublime moments in this meal. The maki roll was classy and beautiful, the cake was heavenly, and there was no doubting the excellent quality of the ingredients. But not all the dishes reached this level of refinement with some of the seasoning and the saucing proved a little overbearing. So was this meal worth it? Not really. Notwithstanding our two-hour wait, our table service was slightly slow. More staff would have helped the situation. Furthermore, we were also seated between the robata grill and the bar, a spot that proved to be both hot and noisy. This meal was hard work for an experience that wasn’t entirely amazing, but no doubt this will not deter the Knightsbridge set. Prices – expensive. Izakaya eating means you can eat as much or as little as you want. Plates start from £5 to £75 for the fillet of wagyu.